BlogThis! : Is There A Problem Here? : BlogThis! I write a blog post using the BlogThis! feature in Picasa. After writing the post and formatting text and images, I click the Save As Draft button to save the post to Blogger. Picasa responds with the following. Not connected to the Internet? I am connected to the Internet. I am logged in to Blogger. I've uploaded another blog post using BlogThis! in the past half hour. I click the Try again link. 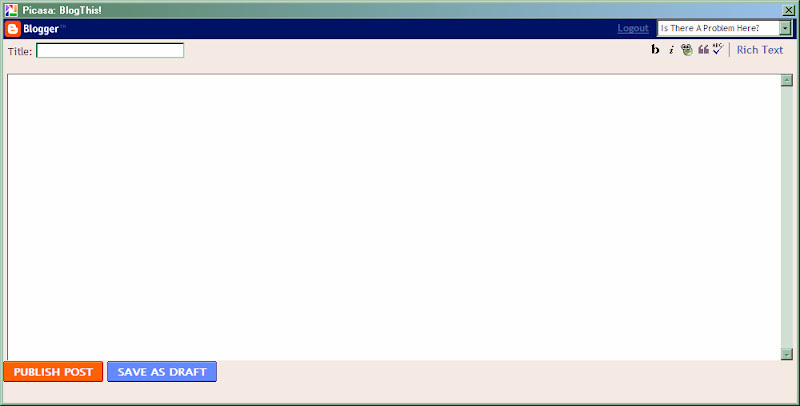 The software responds with the following: a blank document. All my text, pictures, and formatting are gone. Nothing is uploaded to Blogger. Even if I had not been connected to the Internet, my document should not disappear if I try to upload it.